Tickets are valid for the entire 2015 session. Print your tickets (if you buy it online) before going to the park. Printing cost in park is 1€ per ticket. Internet family pack and internet friendly pack are available online. Majority of the park’s attention have mechanical and electrical components and hence, the company reserves the right to close for maintenance. Notification (in writing) will be provided at the ticket desk. The visitors are not entitled to any refund of the entrance ticket once inside the park facilities nor when weather condition cause the decision to close the attraction. If any serious breakdown, catastrophe, threat of explosive or any other type of threat, the Park Manager may decide to vacate the premises for safety reasons. No refund of the entrance ticket or any other concept may be claimed. The company has the right to change the prices, discounts, opening hours or opening dates at any time for reasons of their own. The Park Management reserves the right of admission and may also, if the conduct of one or more users is not correct, proceed to expulsion from the premise. Bus no.s : 103,104, 106, 107 on the Palma (coming from Megalluf/ Palma Nova/ Peguera) and get off at Marineland stop. Love this? Explore the entire list of places to visit in Majorca before you plan your trip. Fancy a good night's sleep after a tiring day? Check out where to stay in Majorca and book an accommodation of your choice. Highlight of our Mallorca trip! Not to be missed fabulous and entertaining Sealions and Dolphins show for the family, adult or children alike. The parrot show is educational and fun to watch. What the attraction may not have in size is more than compensated by the shows which are fun and highly entertaining. Be awed by the intelligent sea lions and dolphins which are so well-trained to fascinate. Absolutely a must do attraction for visitors to Majorca for a memorable time, besides the sand and the beach. Am pleasantly surprised to discover parking is complimentary for park users. There is even a water park for the little ones to cool off in the heat. Great shows. Overall a bit small for the price but the sea lion and the dolphin show was good. If you have seen this kind of show already then it may not be so great but for those who haven't seen such a show this could be great. Online tickets are cheaper. And it hardly takes a minute to do that online booking. Overall the show lasted 15 minutes for Sea lions and another 20 minutes for Dolphin show. 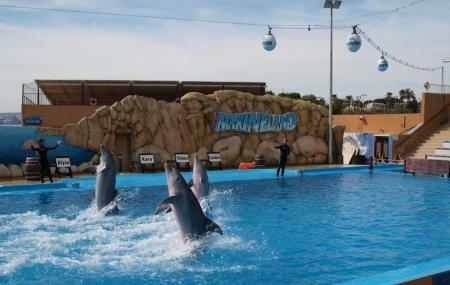 The show seems to be the most important part of the marineland. Overall there are seals, sea lions, penguins, sharks and sting Ray's. Some birds, flamingos, macaws etc.. a few restaurants inside and next to the sea beach. Nice setting but could finish in 30 minutes overall. Overall I would recommend for those who have never seen a show of Dolphins or sea lions. Had a great day here in 2017. Parrot show was really cool, dolphin show was probably one of the best things I've ever seen. Very scenic as right on the coast. Can sit and eat and watch all the rich people on their yachts in the bay and get depressed knowing that you have to fly home at some point and go back to work 😢. As always with these places food is very expensive and next time we'll probably take out own. Really really great place to visit. Was on holiday with my partner 30 minutes down the road and visited Marineland making it my second visit. Great place to spend as a couple or a family. Reasonably priced, especially with the vouchers and offers you can get. Great selection of animals and talks. It does only take a couple of hours to have a proper look around but there is a private beach which you can visit which is a nice touch. The shows are definitely worth seeing and if you can spare some euros get your photos taken with the sea lions and dolphins, brilliant experience all round.